Despite all our advances in communications—from social networking, to blogs, to actual functional video meetings—the trade conference is still a necessity. Maybe not as much for the content, which makes the rounds pretty fast regardless of whether you attend the show or not, but for the serendipitous meetings and social networking (in the pre-Facebook sense). I find something comforting in the rhythm and structure a handful of annual conferences bring to my life. The best ones stay rooted in one location, occurring at the same time, year after year. They are as much defined by time and place as topic. If it’s February, it must be San Francisco and the RSA conference. I’ve attended for years, and despite the draw from the simultaneous Mobile World Congress in Barcelona, RSA is a show I won’t skip. But I do wish MWC would bump itself a week in either direction so I could do both. As everyone knows, this year the press made much ado of a few high profile boycotts of the conference and the two alt-cons, Security B-sides and TrustyCon, that sprung up in response. But I think it’s important to separate RSA the company from RSA the conference. The latter remains the most important security event of the year. Every year, one theme rises above the rest. I’m not referring to the “official” theme, but the trends that appear spontaneously in the valley. The theme this year should be security analytics. The venture community put this idea on an aggressive regime of funding injections. We should expect an entertaining gallery of result good and bad. But either way, we will learn something, and it would be a poor move to bet against this sector’s future. I’m also expecting 2014 to bring some real SDN traction. Traditional security infrastructure is low hanging fruit vendors too often miss. RSA is where SDNs for security will finally get a long awaited debut. CA and Layer 7 will host an afternoon event Monday Feb 24 at the nearby Marriott Marquis, and you are invited. You may recall we’ve held a few of these before, but this year, we have a very special guest. The event features Forrester Analyst Eve Maler, who will talk about Zero Trust and APIs. It is a great way to kick off the RSA 2014, and we’ll even give you a nice lunch. Who could refuse that? I’m off to London for QCon 2012, the 6th International Software Development Conference. I am one of the track chairs for this meeting. I’ve just learned that the show is now sold out, but there is a wait list if you have not already registered. All indications are that this is going to be an outstanding conference, so if there is any way you can possibly attend, you should make the effort. The enterprise is demanding more from the Web than ever before. No longer content with simple web application delivery, the new enterprise web has become an integration point between mobile devices, browsers, legacy systems, and third-party web apps. It is a difficult balancing act. The new enterprise web is highly scalable, but can also reconcile the different service level expectations across each participant. At its core, it enables agile product delivery while maintaining extreme reliability. In this track, we will study the architectural challenges faced by the enterprise that needs to harness the web as a rich delivery channel—and highlight the real world solutions that address these. We will explore the intersection where trends such as virtualization, noSQL, JSON, OAuth, APIs and mobile apps meet. Join us to understand the fine tuning between milliseconds and dollars that can make the difference between wild success and disappointing mediocrity. I’m fortunate to have a great roster of speakers, including Theo Schlossnagle from Omniti, Paul Fremantle from WSO2, John Davies from Incept5, and finally both Marcus Kern and David Dawson from Mobile Interactive Group. The mobile device revolution has upended our traditional view of the world wide web. The enterprise web is now about integration: connecting any device to to any data, reliably and under wildly fluctuating load. How has this affected web architecture, and what changes in the day-to-day operation of the web resource? Join us for this panel of senior enterprise architects, each of whom has met the challenge of the new enterprise web. The panel line up consists of David Laing from CityIndex, Neels Burger from MoneySuperMarket.com, Neil Pellinacci form Tanzarine Technology, and Parand Tony Darugar from Xpenser. Each brings tremendous experience to the panel, and bringing them all together is going to make for a lively and informative debate. I’m looking forward to it. Hope to see you in London. Skill at computing comes naturally to those who are adept at abstraction. The best developers can instantly change focus—one moment they are orchestrating high level connections between abstract entities; the next they are sweating through the side effects of each individual line of code. Abstraction in computing not only provides necessary containment, but also offers clear boundaries. There is also something very liberating about that line you don’t need to cross. When I write Java code I’m happy to never think about byte code (unless something is going terribly wrong). And when I did board-level digital design, I could stop at the chip and not think much about individual gates or even transistors. It is undeniably important to understand the entire stack; but nothing would ever get done without sustained focus applied to a narrow segment. Cloud is the latest in a long line of valuable abstractions that extend the computing stack. It pushes down complex details of systems and their management under a view that promotes self-service and elastic computing. In this way, cloud is as liberating for developers as objects were over assembler. The physical location of resources is one of the first and most important casualties of such a model. Cloud means you should never have to worry about the day a power failure hits the data center. Of course the truth is that as you move down the stack from cloud to system through transistor to electron, physical location matters a lot. So any cloud is only as good as its ability to accommodate any failure of the real systems that underpin the resource abstraction. 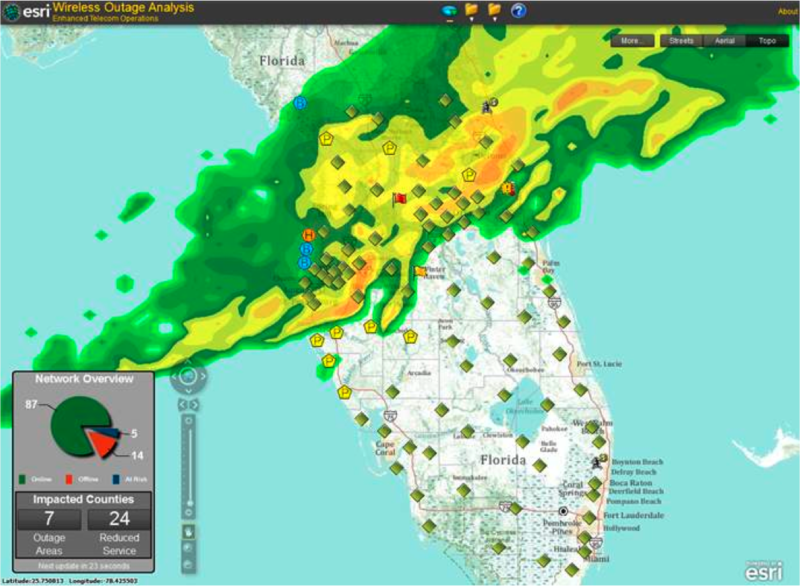 ESRI developed this display to illustrate wireless outages as a storm rips through central Florida. But suppose now that instead of a wireless base station, each green diamond represents a data center that contributes its hardware resources to a cloud. As the storm moves through the state, it may affect power, communications, and even physical premises. Work loads in the cloud, which ultimately could map to hardware hosted inside at-risk sites, must be shifted transparently to locations that are at less of a risk of a catastrophic failure. Today, few clouds offer the mass physical dispersion of compute hardware suggested by this display. 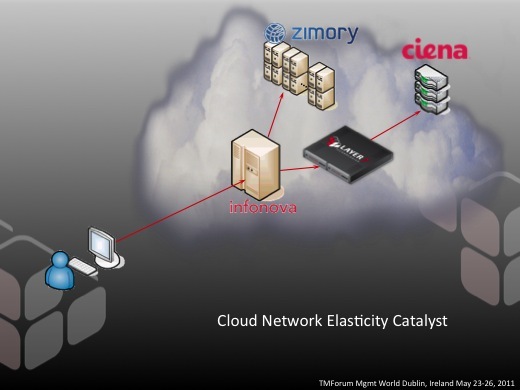 Amazon Web Services, for instance, has the concept of an availability zone, which consists of several massive data centers interconnected within a region (such as US-East, which is in the Dulles area, or EU, which is hosted in Ireland). Their cloud is designed to leverage this regional redundancy to provide continuous service in the event of a site failure. This big data center approach makes perfect sense for a service like Amazon. There will always be a place for the large data center that leverages commodity hardware deployed on a breathtaking scale. But there is an alternative that I think is set to become increasingly important. This is the cloud composed of many smaller compute facilities. We will increasingly see large clouds coalesce out of multiple small independent hardware sites—more SETI@home than supercomputer. This is where our initiative provides real value. These highly mobile, micro-clouds make particular sense in the defense sector. Here, compute resources can be highly mobile, and face threats more diverse and much less predictable than hurricanes. This is an arena in which the physical shape of the cloud may be in continuous change. Keep an eye on my blog for more information. Hope to see you in Dublin. 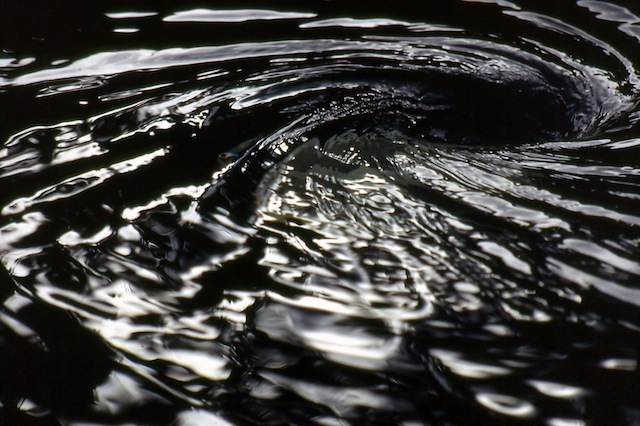 When I was young I was fascinated with the idea that the Coriolis effect—the concept in physics which explains why hurricanes rotate in opposing direction in the southern and northern hemispheres—could similarly be applied to common phenomenon like water disappearing down a bathtub drain. On my first trip to Cape Town many years ago I couldn’t wait to try this out, only to realize in my hotel bathroom that I had never actually got around to checking what direction water drains in the northern hemisphere before I left. So much for the considered rigor of science. It turns out of course that the Coriolis effect, when applied on such a small scale, becomes negligible in the presence of more important factors such as the shape of your toilet bowl. And so, yet another one of popular culture’s most cherished myths is busted, and civilization advances ever so slightly. Something that definitely does not run opposite south of the equator turns out to be cloud computing, though to my surprise conferences down under take a turn in the positive direction. I’ve just returned from a trip to Australia where I attended the 2nd Annual Future of Cloud Computing in the Financial Services, held last week, held in both Melbourne and Sydney. What impressed me is that most of the speakers were far beyond the blah-blah-blah-cloud rhetoric we still seem to hear so much, and focused instead on their real, day-to-day experiences with using cloud in the enterprise. It was as refreshing as a spring day in Sydney. Greg Booker, CIO of ANZ Wealth, opened the conference with a provocative question. He simply asked who in the audience was in the finance or legal departments. Not a hand came up in the room. Now bear in mind this wasn’t Microsoft BUILD—most of the audience consisted of senior management types drawn from the banking and insurance community. But obviously cloud is still not front of mind for some very critical stakeholders that we need to engage. I was also struck by a number of insightful comments made by the participants concerning security. Rather than being shutdown by the challenges, they adopted a very pragmatic approach and got things done. Fennel remarked that Westpac’s two most popular APIs happen to be balance inquiry, followed by their ATM locator service. You would be hard pressed to think of a pair of services with more radically different security demands; this underscores the need for highly configurable API security and governance before these services go into production. He added that security must be a built-in attribute, one that must evolve with a constantly changing threat landscape or be left behind. This thought was echoed by Scott Watters, CIO of Zurich Financial Services, who added that we need to put more thought into moving security into applications. On all of these points I would agree, with the addition that security should be close to apps and loosely coupled in a configurable policy layer so that over time, you can easily address evolving risks and ever changing business requirements. The entire day was probably best summed up by Fennel, who observed that “you can’t outsource responsibility and accountability.” Truer words have not been said in any conference, north or south.